That’s because on the new U12+, HTC is blowing out the phone’s squeeze functionality it pioneered on the U11 last year with a bunch of new features. So now in Edge Sense 2, along with being able to squeeze the phone to summon an app, you can double tap the sides of the device to turn on one-handed mode, or if you want, set the double tap to function as the back button so you can skip the traditional Android nav keys at the bottom of the screen. But that ain’t all, because you can also press and hold the U12+’s sides to disable automatic screen rotation or auto brightness, or simply squeeze the phone to summon the Google Assistant or Alexa (whichever you prefer). But the best part about the U12+’s squeeze abilities is it appears all of these functions are customizable, so if you don’t like what a squeeze or hold does out of box, you can change it to suit your needs. Edge Sense 2 is even smart enough to know which hand you’re holding the phone with, so lefties don’t get shafted like they do on a lot of consumer electronics. That’s two different front cameras. Funky squeeze controls aside, the U12+ is also taking the 12-MP camera from last year’s U11, which was one of the most underappreciated smartphone cameras of 2017, and going nuts by adding two additional cameras (one in front and one in back), bringing the U12+’s total camera count to four. On both sides, that second cam gives you portrait-style depth of field effects, while in back, the U12+’s dual-cam arrangement also offers things like better HDR and a 2x optical zoom with a handy one-touch auto zoom. 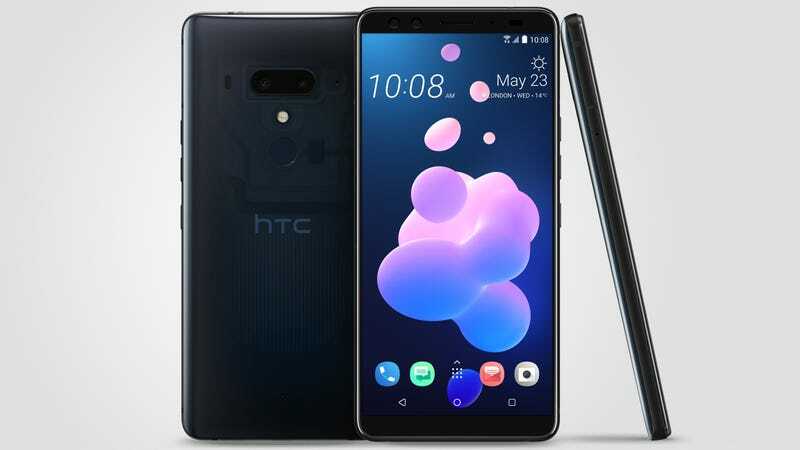 As for specs, the U12+’s components look pretty solid, with HTC including a Snapdragon 845 chip, 6GB of RAM, 64GB or 128GB of storage, 6-inch 2880 x 1440 LCD display, microSD card slot, IP68 water-resistance, rear fingerprint sensor, and a decent-sized 3,500 mAh battery. The only thing I think the U12+ is missing is a headphone jack. Though, you do still get HTC’s Boomsound stereo speakers, which in the past have been the best among the best speakers you could get on a phone. You also get a pair of wired USB-C earbuds with active noise cancellation, and Qualcomm’s aptX audio technology which promises support for 24-bit audio over Bluetooth. That said, I’m still worried about the U12+’s price, because starting at $800 for the 64GB model, or $850 for the 128GB version, I’m not sure this phone will be enough to turn around HTC’s cratering sales. Here’s hoping that after getting the chance to do a full review, the U12+ proves me wrong, because it’d be nice to see a phone that’s not obsessed with chasing trends to get a little love.